The friction between the designer of the proposed Community Park on the site of the former Par 3 Golf Course and the City appears to have lessened and, while not everyone is happy, plans are moving forward to the Design Review Board. Tensions ran high at the City Commission meeting in April when consideration was given to terminating the agreement with Savino & Miller Design Studio. Neighborhood residents spoke in favor of the firm’s passive design with lots of green space while City reps said the design was not responsive to the needs of the entire City. The Park was scheduled to begin construction in the Spring of 2016 and be completed this Summer, however, it has not made it out of the design phase. Of greatest concern in the design that includes a lake and rolling hills was if there was enough flat space for kids to play. The tension boiled over when City officials said they were frustrated that the designers were not responsive to requests for revisions. Miller has “a conflict of interest” as a park neighbor Commissioner Ricky Arriola told him. As a vendor he said Miller should be saying, “I want to work with you.” Instead, he said there are delays because Miller doesn’t like the changes that are recommended by the City. But… cooler heads prevailed and after a meeting of Parks and Facilities Advisory Board Chair Carolina Jones, Miller, and partner Adriana Savino, the three thought it was worth another round of discussion with the Parks Board. This week, Miller and Savino further discussed their plans including increased space for flat fields and a smaller lake. The group expressed appreciation for the quality of the work and effort of the designers while disagreeing, in some cases, with the overall uses of the Park. A couple of Board members would have liked to eliminate the lake and include more playing space but Capital Improvement Projects Director David Martinez noted that the uses were guided by the original RFP and could not be changed. 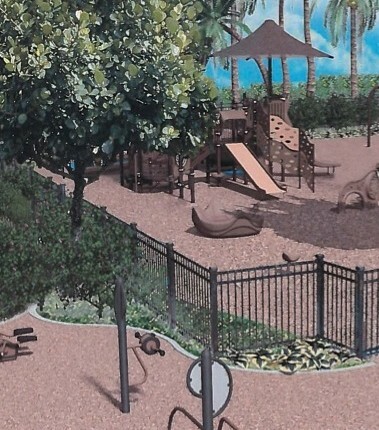 The group voted 6-2 to approve the plans with one change to increase the size of a smaller play area. Commissioners Alemán and Malakoff attended the Parks Advisory Board meeting and were satisfied with the changes. The plans now move to the Design Review Board for consideration. Allison Park: Meanwhile, it seems the only ones happy with the ground cover at the almost completed Allison Park are the feral cats who are using the wood mulch as a giant litter box. Capital Improvement Projects Director David Martinez said when the park was planned, there were concerns over “crumbs” from poured-in-place rubber ground covers so wood mulch was substituted but, after complaints from neighborhood residents about its attraction to the cats and comments from the disabled community that the mulch is not the best ground cover for the ADA playground and fitness area, his group is suggesting installing the rubber. It will be on the City Commission agenda next week.